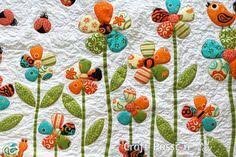 Work on your hand appliqué projects with a group of fellow appliqués. Share what projects you’re working on, your favorite tools or techniques with the group. NOTE: After a few gatherings, if you are interested in joining the group, there is a $10 annual dues, this covers the cost of the group’s donation to Sutter Breast Cancer Quilt Auction and our annual Christmas dinner in December. If you working on machine appliqu? you must bring your sewing machine in good working order and the necessary machine accessories, cord, foot pedal, standard sewing supplies. You must know have to use your machine.